Hello, I’d like to speak to you today about a sensitive subject we all have experienced at some time in our life. We’ve had parents, friend’s, brothers, sisters and spouses that have passed away. Each loss is different in its own way. I speak of one specific area that leaves us both grieving in anticipation of a loved one that is beyond help with some form of dementia or life ending disease such as cancer. I can speak for myself that I spent nearly one year that we knew my wife was going to pass away. You wake up facing the same probability each day and wonder when the end will come. Some of us are luckier than others and the end comes in a relatively short period of time others have to endure years of watching our beloved slip farther away. Your pain is as real as theirs is emotionally and, in the end, while there is relief they will no longer suffer you must now confront the loss and decide what path you will take. But this is a subject for another article. This time I would like to talk about those that are living another kind of nightmare known as Dementia or Alzheimer’s. There is no one-size-fits-all solution to this painful situation and there is no good or right answer for how to deal with it and one of the best things that you can do for yourself is to get involved with some form of grief share, bereavement group or Alzheimer’s support group. What I want to bring out is some of the feelings that no one talks about even in one of the support groups I mentioned. Society has set up some kind of rule that says if you start dating or seeing other single people to soon after your spouse has passed away you are not respecting their memory or if your loved one is confined to a hospital and may not even remember your name you have to wait to begin to live again. Everyone seems to feel you are supposed to wait until they pass away then go through a grieving period before you are able to live again. They don’t know or understand what we have been through so why we should wait for their approval. Researchers found that those who had been single their entire lives had a 42 percent increased risk of developing Dementia or Alzheimer’s and that those who had been widowed faced a 20 percent higher risk. The bottom line here is we are social animals and need companionship to stay healthy both physically and mentally. I encourage you to leave your thoughts and experiences in the comments about your feelings for others to read and benefit from and realize are not alone in their thoughts. This will be further impacted in 2018 by yet another cost increase in Medicare part B changes which in all probability cause supplemental health insurance rates to rise. There is little we can do to change any of these items above and I can go on for hours quoting numbers and yelling the sky is falling but the truth is no one knows where it will end. I am going to talk about some of the opportunities that are out there that can supplement your income and put cash in your pocket. I am not going to try to sell anything or try to get you to send me money. All I want to do is help those that are in the same boat I was after my wife passed away. I will only tell you this I have been turned down for survivors benefits, as well as disability. I am not able to live on my retirement alone and I know many of you are in the same boat as I am. Even if you’re not right now at some point you may be. Even if you are living comfortably wouldn’t it be nice to take off on that vacation or go to some nicer restaurants and not have to look for the blue plate specials? Here is what was in my email inbox today everyone should be getting one of the new Medicare cards. Keep an eye on your mailbox — we’re starting to mail new Medicare cards in your state! Remember, once card mailings begin in your state, it’ll take about a month to finish. So you might get your new Medicare card at a different time than friends or neighbors in your area. One tip: if you have a MyMedicare.gov account, you can sign in and see when your new card is expected to mail. Don’t have a MyMedicare.gov account yet? It’s easy to sign up — just visit MyMedicare.gov. It’s a free, secure way for you to access your personal Medicare-related information. Wondering what’s new? The new cards are still paper, but they will look a little different. The biggest change is that your new card will have a new Medicare Number that’s unique to you, instead of your Social Security Number. This will help to protect your identity. Though you’ll have a new card, rest assured your Medicare coverage and benefits will stay the same. You can update your preferences or use our 1-click unsubscribe to stop receiving messages from the Medicare Team. Below is the latest information I received in an email. If you live in Delaware, District of Columbia, Maryland, Pennsylvania, Virginia or West Virginia — keep an eye on your mailbox — your new Medicare card is on its way! Card mailing in your state takes about a month to finish, so you might get your new Medicare card at a different time than friends or neighbors in your area. Remember, you can still use your old Medicare card until your new card arrives. Haven’t received your new card yet? Log in to your MyMedicare.govaccount to see when your new card is expected to hit the mail. If you don’t have a MyMedicare.gov account, you can sign up in just a few easy clicks. 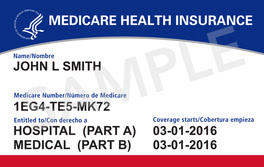 Your new Medicare card has a new look and a new unique Medicare Number, instead of a Social Security Number, to better protect your personal identity. The new card and number won’t change your Medicare coverage or benefits. Note: If you’ve already received your new card, that’s great! Start using it right away.